Garish weddings, cakes groaning under sugar sculptures, pancake and blue eye shadow, bling and blow-dried beehives, melodramatic soaps and mushy greeting cards crammed with pink hearts, gilt and glass drawing rooms,red and oily overcooked curries…are just some of the things that make me scream OTT (over the top). I’m more of a less is more kind of person. And this is true of my cooking too. There’s nothing I dislike more than making elaborate dishes which involve subjecting the ingredients to multiple processes of boiling, frying etc till they resemble and taste like nothing. To me, simplicity is seductive – like pasta tossed in the best extra virgin and garlic or a clear savoury broth brimming with flavour, or a salad where crisp greens glisten with freshness under a fine spray of lemon juice. And some days I yearn for simple and healthy but delicious meals. So I tried this delightfully easy, steamed chicken and ate it with Thai rice paper rolls stuffed with sesame-speckled spinach and carrots. Minimum cooking and very few ingredients, but you get a meal with an almost zen-like personality. I’m sure you’ll enjoy it like I did…with a quiet sense of pleasure and satisfaction, (imagine your mother stroking your head while sleep gently steals over you). I used thighs and drumsticks rather than breasts because I prefer them for their juicier meat, but you can just as easily use breasts. 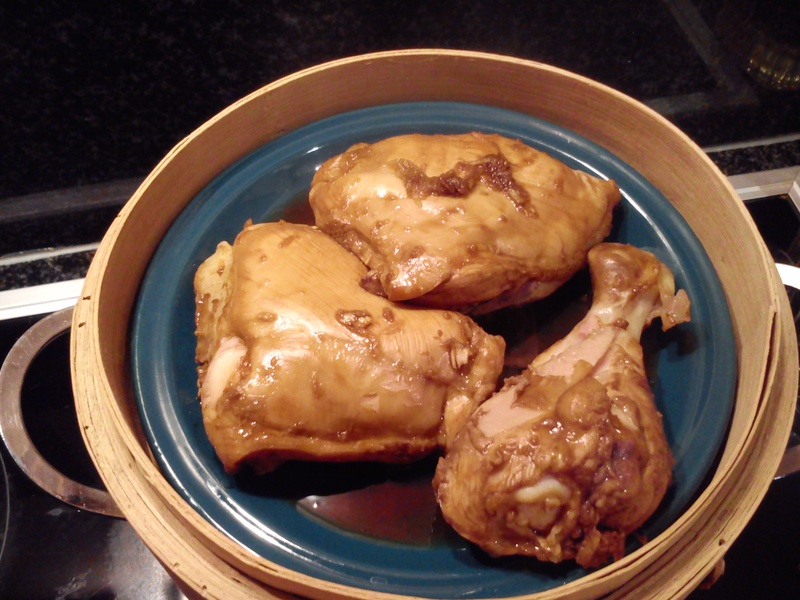 Wash and dry chicken pieces and marinate in soy, fish sauce and grated ginger for 2 hours. 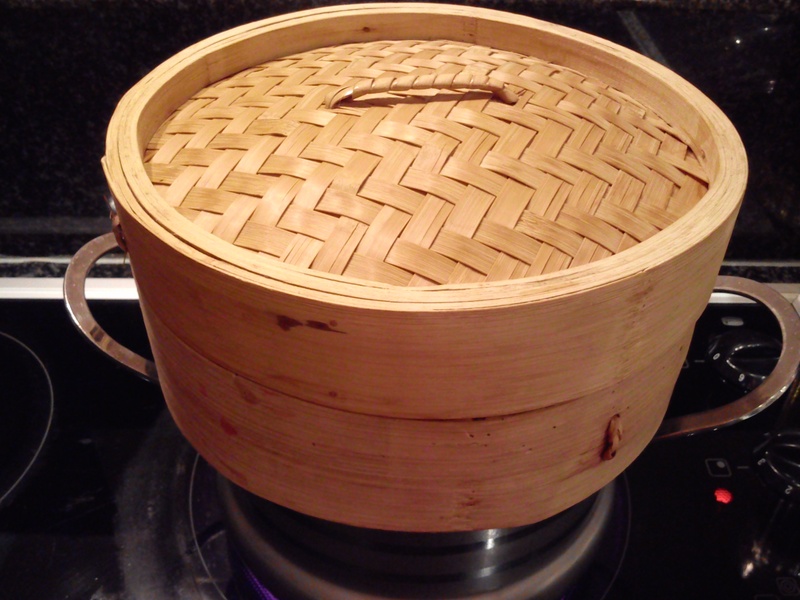 Boil a large pot of water, place a bamboo steamer to fit on top. 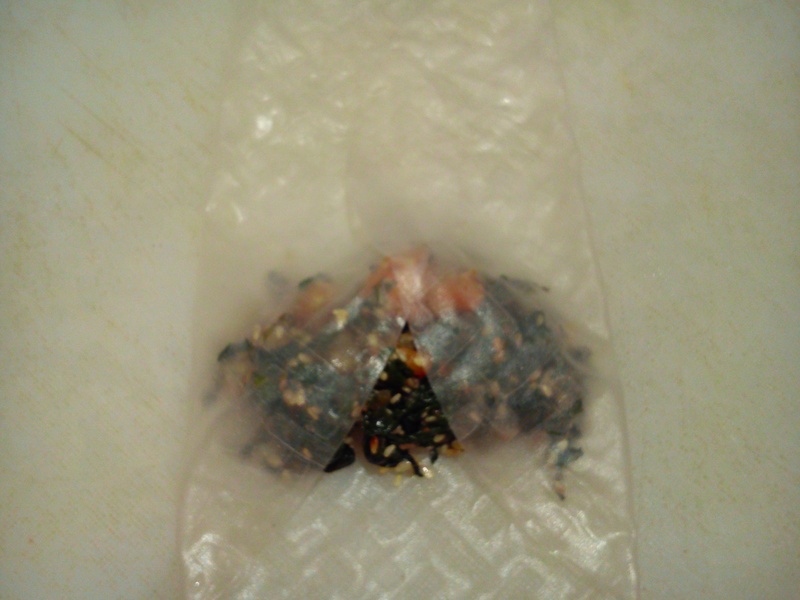 Put chicken pieces on a plate inside the steamer and steam for 25 minutes turning the pieces midway to ensure even cooking. Serve warm drizzled with the resulting jus. Heat oil in a pan and stir fry the garlic for half a minute and toss in spinach and carrots. Fry on medium-high heat for 5-7 minutes till cooked and lightly browned. 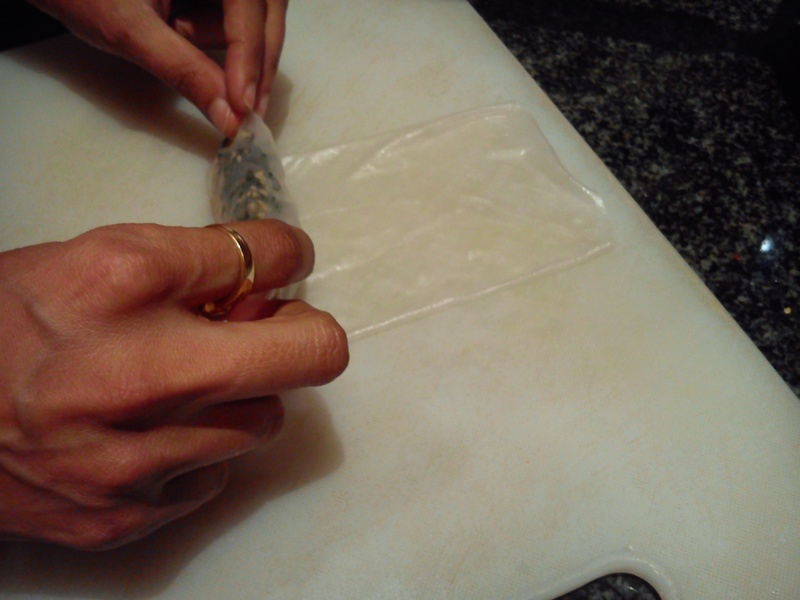 Season with salt and mix in sesame seeds. Cool. 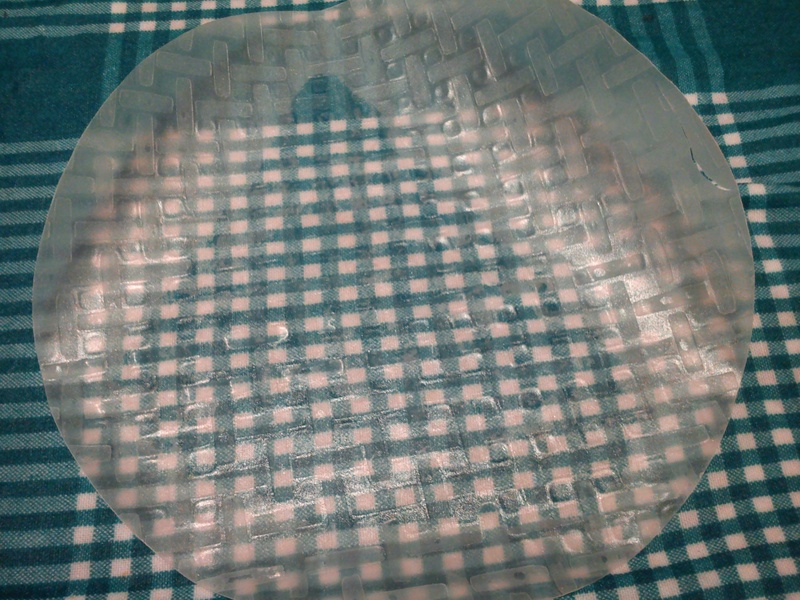 Wet a tea towel and spread on the kitchen counter, place each sheet of rice paper on the towel and gently press to wet both sides (for a minute) till the sheet becomes flexible to roll. 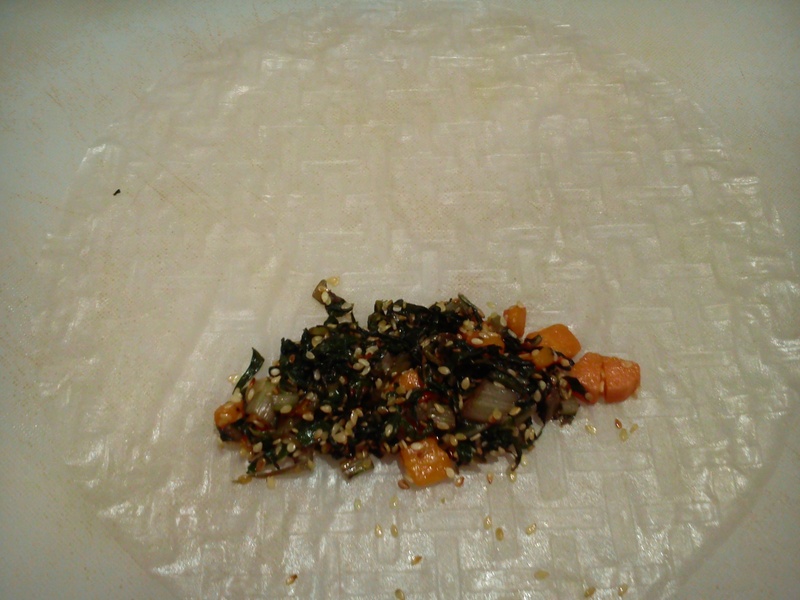 Gently lay one sheet on a chopping board and spoon 2 tsps of spinach filling an inch above the edge, fold in both the left and right sides and the bottom and roll to resemble a spring roll (see pictures). Make the rest of the rolls in a similar fashion and serve with the chicken jus or a dipping sauce. 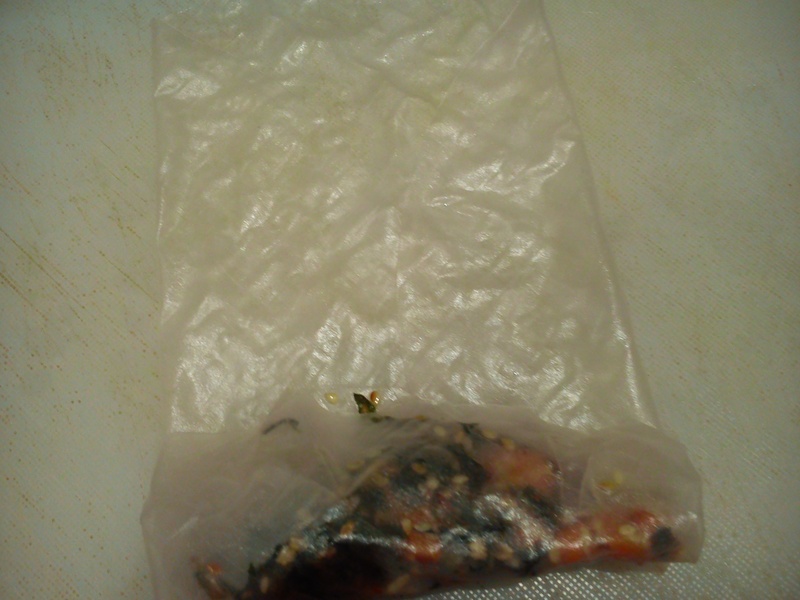 Total time does not include time for marination.